Pfister’s Pond in the Tenafly Nature Center, just before dusk. 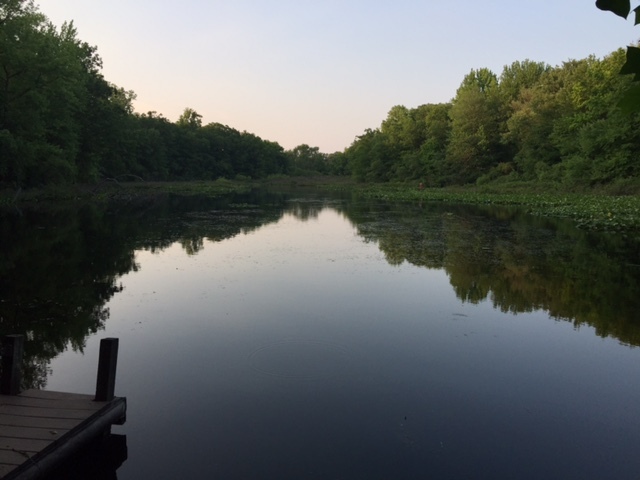 Tonight’s posting is a short but sweet one, trail heads, a bit of quietness – and I think we could use a bit of quietness after that ruckus today over the alligator being caught in the Passaic River. Do you believe things happen for a reason, or do you tend to think in terms of coincidences? That’s one of the questions a group of hiker friends and I were mulling over as we sat on the banks of Pfister’s Pond at the Tenafly Nature Center early one evening back in June. I’d gotten the notice through the NJ Nomads hiking group, which I follow on Meetup, that there was going to be a short early evening walk around the center, just before sunset. It sounded appealing – and considering that it was shaping up to be THAT kind of week at work, I figured it would do me and my perpetually frazzled psyche some good. So I made my way up there after work on the evening of the walk – and got a scenic tour of the streets of Englewood and Tenafly in the process – and found my way to the gravel parking lot and trail head tucked into the woods at the end of Hudson Avenue. Met up with the other three members of NJ Nomads out for the hike: Nora, Nida (she’s the group leader) and Shahid. We had the ceremonial passing around of the bottle of bug spray and then set out. 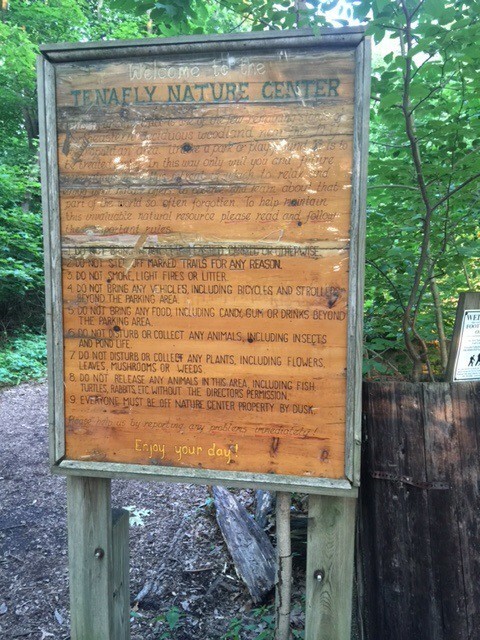 The sign at the parking lot and trailheads for the center. Our visit was by no means a long or strenuous hike – especially since we had to be out of there by dusk, according to the center rules. So our hike was just a quick amble around a couple of the walking trails, and out onto the wildlife viewing platform out in the middle of the pond, followed by a longish sit-and-talk by the pond. But within the space of an hour or so, we saw red-winged blackbirds, a giant snapping turtle (may have been others), and a wild turkey hen. And we heard the bullfrogs croaking – from the sounds of it there were quite a few of them out on the lake that evening. The croak of a bullfrog – it’s not the “ribbit, ribbit” that we think of with most frogs; it’s kind of this mooing, slightly buzzing “braae, braae” sound. That, come to think of it, might be where the bullfrog gets its name from. We got to talking about various things, including some deep philosophical/spiritual stuff. And someone asked, do you believe things happen in the universe for a reason, or do you tend to think in terms of coincidences? I don’t remember everyone’s exact answers, only that they were both sort of different and sort of the same. And at other moments, we just sat there silently and listened to the sounds of the oncoming night. Eventually, we did have to split, with dusk by then setting in, and the mosquitoes coming out in full force. Was it coincidence that we four clicked on the RSVP button for the walk? Because it sounded like we were all four people who definitely needed to hit the pause button on work-related stresses. Whatever the reason, it felt like the walk in this little sanctuary did each of us some good.